Players in German football's top two divisions will this weekend wear shirts carrying messages supporting refugees. The number of migrants entering Europe has reached record levels this year, driven largely by the Syrian conflict. Team shirts in the Bundesliga and Bundesliga 2 will have a patch on the left arm with #refugeeswelcome and the phrase 'We're helping'. Bayern Munich have set up a 'training camp' for refugees and will donate 1m euros (£730,000) for refugee projects. Borussia Dortmund invited 220 refugees to watch them play Norwegian side Odd in the Europa League, while Mainz gave out 200 free tickets for their match against Hannover. Hertha Berlin general manager Michael Preetz said: "The refugees crisis concerns everyone, nobody can look away. 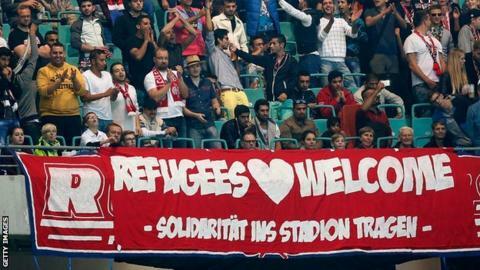 We Bundesliga clubs must use our reach, influence, and ability to help the many refugees who have already suffered so much. The message replaces a logo for logistics company Hermes and is supported by Bild newspaper.